The paperboy begins his route at the start of the street (bottom of the screen) and progresses towards the end. 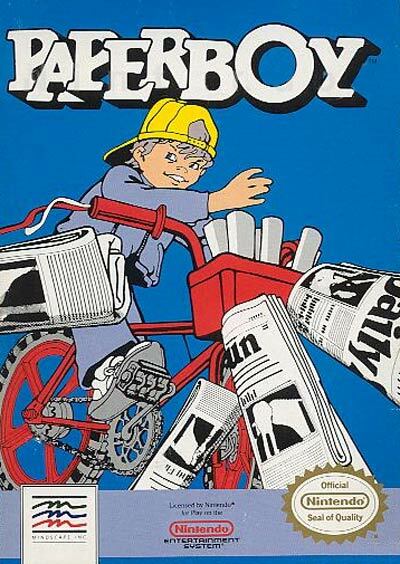 The player can control the paperboy's speed: faster delivery earns a higher score. But the paperboy is in constant movement and cannot stop moving forward until the level (day of the week) has ended. The primary objectives of the game are to keep as many subscribers as possible and to stay alive. Secondary objectives include vandalizing non-subscribers' homes and hitting nuisances with newspapers. Keeping subscribers is fairly straightforward: the player must deliver a paper to them. While the player may deliver more than one paper to each customer, they have to avoid accidentally damaging their homes, such as by throwing a paper through a closed window. Delivering a newspaper directly into the customer's newspaper box (or mailbox, as the voiceover calls it) earns bonus points. Accidentally damaging a customer's home or failing to deliver a paper causes the customer to cancel his subscription and may cause him to set traps for the paperboy the next day.